At the beginning of the year Eleven and Alice inadvertently created a child with their memories, called The Sapling. He was destined to destroy the universe, but did not want to. In the previous arc, Sapling spread physical roots out across the TARDIS, in an effort to save it, but only made things worse. To top it all off, the Scream shows back up. He has been stalking them from the beginning of all of this. The crew but doesn’t remember thanks to the Scream being part of a species that is immediately forgotten whenever anyone looks away from them, known as the Silence. He’s absorbed Sapling, and all of Sapling’s creative yet destructive powers. Reading part one of the “Hungry Thirsty Roots” arc isn’t a must for understanding this second part. Doctor Who fans can pick up this issue and get Easter egg references to various regenerations, locations and references. Even most readers could parse out what is happening, thanks to Titans concise recap pages. The writing team did a good job of explaining how our team arrived where they were at, despite the surreal surrounding. However, the solution for the big bad takes more than a casual read to parse out. At first I believed I had missed something. So much so, that I even went back to read previous issues. It wasn’t until I reread key pages multiple times and thought about how the Silence’s abilities worked that it clicked that I hadn’t missed anything. There will be readers who might consider the resolution a plot hole in logic. I can’t decide how I feel, since I’m still trying to understand how the original Scream character have met the same fate as the other beings he created. 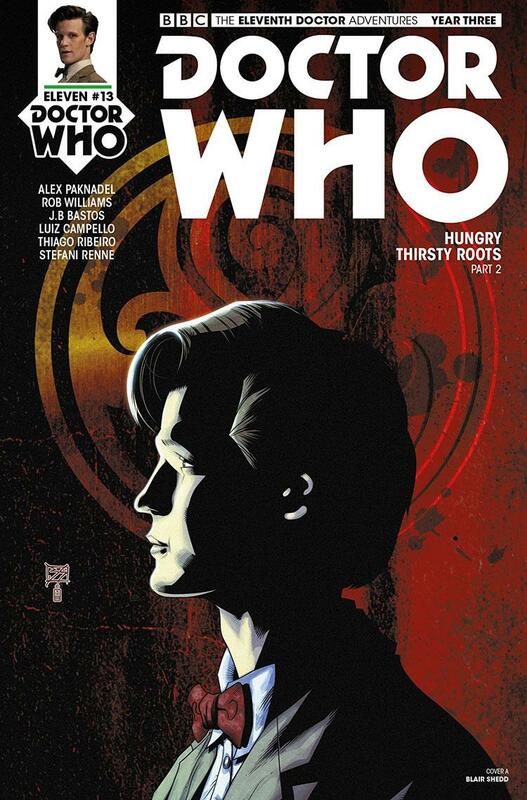 The art captures the likeness of the Eleventh Doctor, portrayed by Matt Smith, well. There are a few pages where his hair feels inconsistent or from separate time eras, on the same page. One panel his beard looks neat, the next shaggy. Later on his hair looks long and unkempt, while in the next panel it’s shorter and quaffed. They are such slight and subtle changes it’s unclear if this is purposeful, to show them trapped in their memory created planet, or genuinely inconsistent art. My only other thought while trying to figure them out was the line work having multiple references from the television show used while creating the page. The colorists’ work was key to this issue. There is almost this rainbow like affect throughout the issue and backgrounds. The pages seem to slowly blend from browns and reds to greens then purples and back again before everything becomes “white.” I say that in quotations because there are subtle shades throughout the white backgrounds creating depth in a world without details, except the characters. It also helps you to realize how much detail there was in the line work and coloring before these scenes. Massive amounts of small lines to show rock, roots, plants, structures… down to the posters and signs on the wall of Alice’s room hold so much detail. I’m a sucker for the quick emotional ending monologue that are common in Moffat era Doctor Who. This issue does not miss the opportunity to give Alice an inner one, which caused my tears to build up. I count it a personal victory that I didn’t actually cry, but still came close. Alice’s journey with the Doctor has been long and emotional. Over the course of this series we have watched the Sapling grow, learn and fight back against his destructive destiny, becoming someone new. It was a big fear, of mine, that this comic fairytale family would be destroyed, along with the Sapling, at its end. Now, even if the family members go their separate ways, I will feel at peace with this resolution.